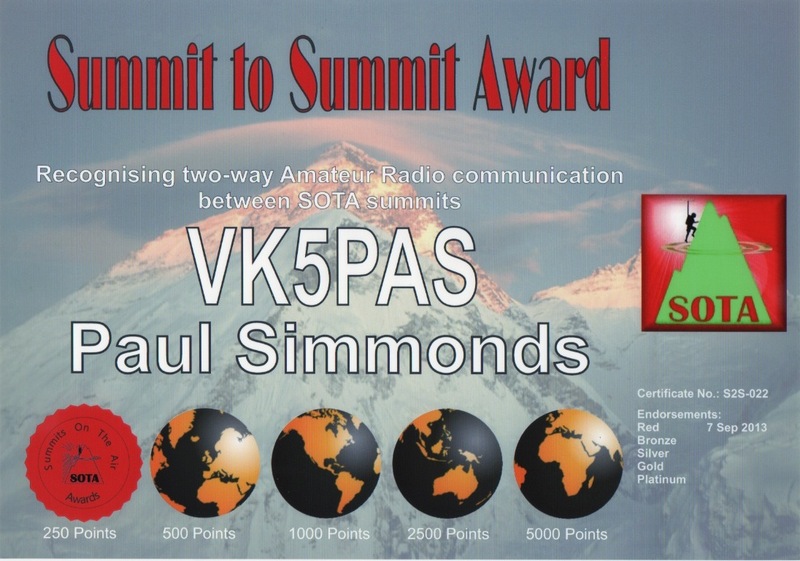 I received my Summit to Summit certificate (250 points) today. I notched up a large number of Summit to Summit contacts during my recent week away to SE South Australia & western Victoria. In fact it was my contact with Glen VK3YY on the 7th September, that pushed me over the 250 point mark. I was on Mount Rouse, VK3/ VS-048 in south western Victoria, and Glen was on Federation Range, VK3/ VN-003. I will be sending Glen a certificate & a special QSL card, to thank him for the contact. I have only been involved in SOTA since March, and have thoroughly enjoyed the last 6 months. Every S2S contact is always a real pleasure. This entry was posted in Summit to Summit certificate. Bookmark the permalink. Hi Paul, congratulations on receiving the S2S Award. S2S is one of the many interesting activities in the SOTA program. I started off a bit slow. It seemed all my hilltop activations didn’t coincide with other activators. You are doing terrificly well with your S2S score.